Free for Surf Jam contestants. 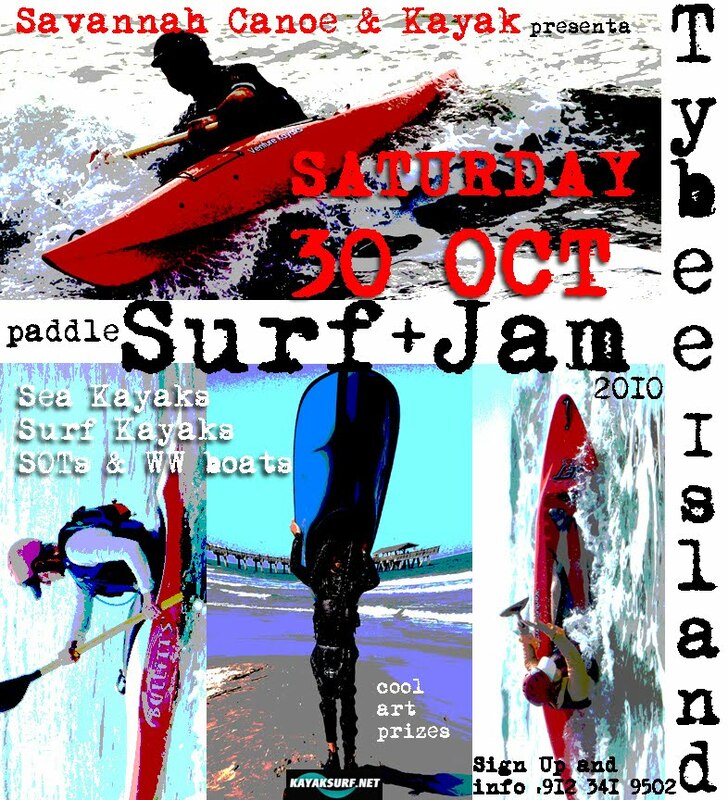 We had hoped to have former local paddler Dave White sign up for this years Paddle Surf and Jam. Unfortunately Mr White is still west side and unable to attend. He expressed his disappointment via email. We had this helmet specially made for him. There are several other 'faces ' that will also miss this years event for one reason or another...Rick and Sarah had a baby for goodness sakes ! You will all be missed, but thanks for your best wishes. Cooler temps are forecast for the day and surf is expected to be 'not great but good enough'. Prizes remain excellent. 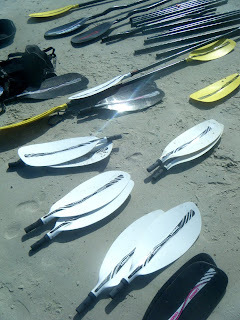 Mr Dennis was back on Tybee Island today promoting his new boat, the Pilgrim and showing off his recent take over and make over of Lendal Paddles. Nigel is in the process of making several improvements to the paddles which will now be made at his factory in Wales. We welcome the return of this excellent product into the hands of a dedicated paddle sports manufacturer, as well as providing an alternative to the mighty Werner. More about these paddles soon. 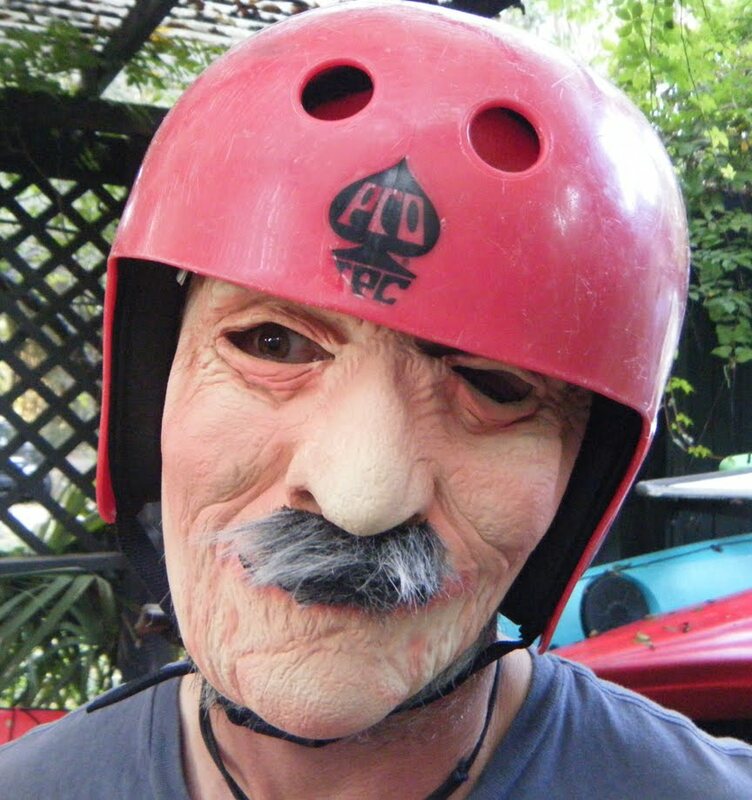 Can You Beat This Old Fart ? He'll be at the Paddle Surf & Jam. Come on down and kick his saggy arse. At this year's Tybee Paddle Surf and Jam, we will be giving away a kayak, paddle, PFD and helmet. As many local nonprofit organizations know, our favourite nation is donation and we are feeling the love right now. There will also be a bunch of other prizes which will all be handed out in a draw. Anybody can win this stuff, but you have to be registered and partake in the competition. And a reminder, it is a masked event, so if you do not have a hat or mask you will be allocated one. ...the fashionable Girl Scout Leader who let her kids run amok around the camping store. She then gathered all the girls together astride a kayak for a photo opp. "Everybody say 'Expensive Kayak !'" to which they all replied "Expensive Kayak". It seems the demise of a once great idea and institution continues to fall victim to the mediocrity and shallowness of the 21st century. For those who missed it, or otherwise did not receive the memo update, here is the schedule for the SC&K last week of operation for 2010. Sunday 9-12 - The last 3hr tour for the next 4 months. Skidaway Narrows. 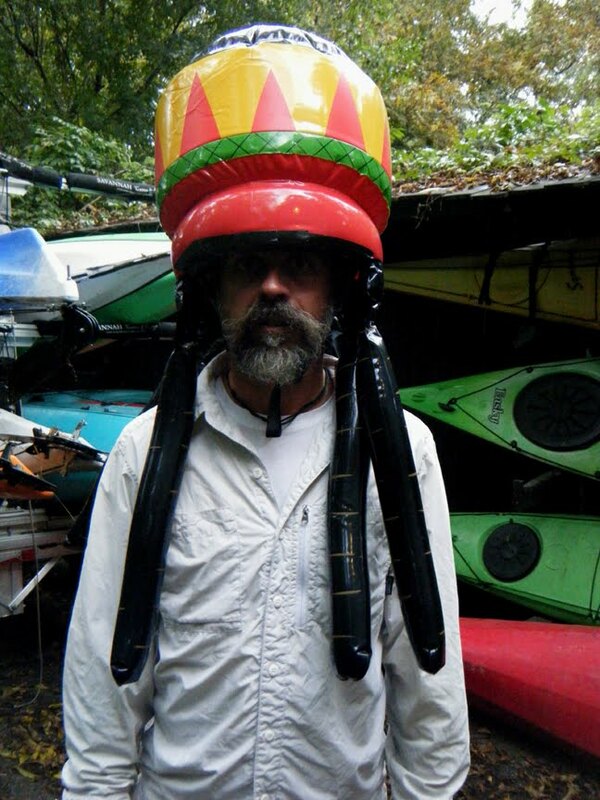 Monday 10am - SOT Surf Kayak Demo @ 18th St.
3pm - Tiderace Demo @ Alley 3. Thursday 10am - Mega Surf Kayak Demo @ 18th St.
Friday 10am - Tandem Surf Kayak Practice Session @ 18th St.
Also...everything is 'On Sale' all week. Martha was in town this weekend for some rolling, surfing and paddling abuse and, of course, we were happy to oblige. 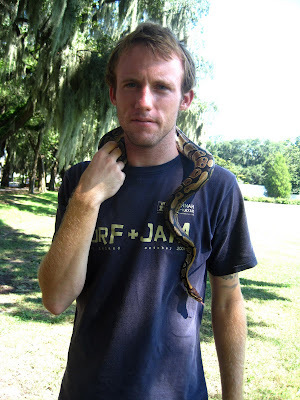 I met a random stranger in the park in Savannah, and took a lovely photo of him with his pet snake. He was wearing a T-shirt from your last year's Surf and Jam day, so i just wondered if you/anybody there happens to know him!? I wanted to send him the picture. I know it's a long shot and maybe he was just there at your surf and jam day and bought the T-shirt and you don't know him at all, but if you do happen to recognise him could you kindly put us in touch and i can send him the photo? I am attaching the photo for your hopeful identification! Thanks Becca, that is Patrick.... surfer, paddler and snake charmer extraordinaire. Glad to pass along the photo and put you in touch. No doubt Patrick will be honing his snaking skills for next week's PS&J. Here's a quick edit of our three days under the Cape Hatteras lighthouse. As you can see the weather was fantastic. Congrats to all the winners and to all those who just showed up, took part and generally supported the US surf kayaking scene. Next year looks very promising for a great World Championships. A long journey, but well worth it to partake in the first US Nationals on the East coast in over 10 years. After a 10 hr trip that included two ferry rides we arrived at the location for the 2011 World Championships...under the Lighthouse on Cape Hatteras. Air Temps for the weekend were in the high 70's and water temps must of been high 60's. Winds were light. Wave conditions were excellent as the 3 ft swell kicked up a steady 4-5 ft break. The largest wave of the weekend was probably 8-10ft and was caught by Garazi Iturralde from Basque Country. were represented. The West Coast contingent was strong and took home a bunch of medals. Great Lakes surfers were well represented by John Tarbell who also took his place on a few podiums. The Basque team, led by Edu Exteberria, put on a great display though out the weekend and were a great inspiration and fun to watch. And congratulations to Anthony Bell, the well deserved new US Champion in both HP and IC. And to the US Womens Long Boat Champion, Linsey Usher. US World Championships will be hosted by Eska at this same location sometime between the Sept 28 and Oct 10, 2011. We will be putting up a short video of the event soon. Conditions are looking favourable for a great weekend of surf kayaking here at the Cape Hatteras light house. Winds dropped off this afternoon giving us great 4 ft and more practice waves. "But I did break my favourite paddle" said one of the Tybeee Team paddlers tonight. The Basque team are here and looking very strong, and young. Paddlers from all over the States, England and Spain will compete for the title of US champ. The Surf Kayak Nationals begin tomorrow morning with the first heat, Grand Master IC starting at 8am. Great pictures and video coming soon. 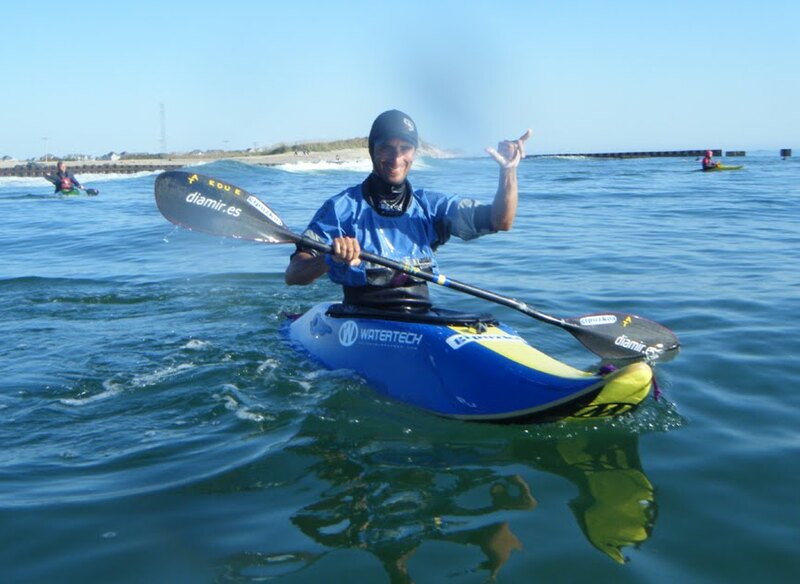 The Kayak Polo Nationals were recently held in N.C. After competing, NYC team player Mikhail stopped in to visit Savannah Canoe & Kayak for some sea and surf R&R. Once again October has been true to itself with fine weather, surf, and miles of empty beaches. Surf report for the OBX Surf Kayak Nationals this weekend is small, but decent. Three Tybee surf paddlers are attending the competition. We will keep posted with full coverage as the events unfold. We are pleased to announce the addition of Cobra Kayaks to our line up. 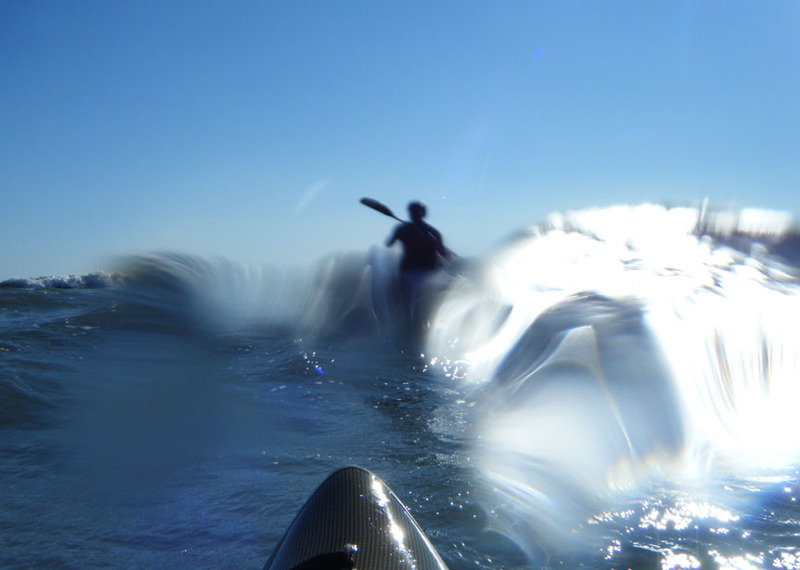 We particularly like Cobra because they offer a wide selection of kayaks for all paddling activities including day recreation, expeditions, surf ski's, training, and fishing. Cobra are the leading supplier of value driven, high quality, sit on top kayaks. Perfect for lakes, ocean, rivers, and anywhere there is water. All boats are Roto-molded from Super Linear Polyethylene. 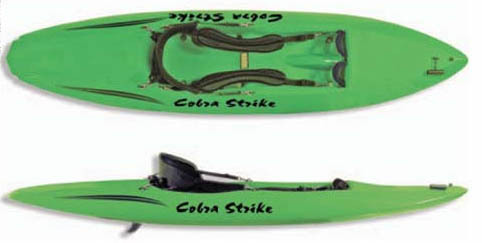 We will be carrying the most excellent surf SOT-The Cobra Strike as well as using it in our instructional fleet. We will also carry the Cobra Surf Ski and Cobra Eliminator...2 very well priced entry level training/racing skis. The water is cooler, the beaches are cleaner, the waves are better, the crowds have gone and the locals have sobered up. October is one of the best months to kayak on the Ga coast. So what's in store for the paddler here. The Tybee Paddle Surf Team are off to the U.S Surf Kayak National Championships in OBX next weekend. See 4 local paddlers get hammered in front or their peers (piers)on 15ft faces at Hatters Oct 9/10th. 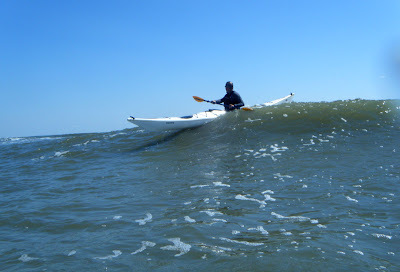 Lots of Surf Kayak classes all month on Tybee. Just call and we'll get you hooked up. Oct 25-29 All week of Sea and Surf classes. SoT 101 Surf Kayak Class on Oct 25th. Tandem Surf Kayak Class on the Oct 28th. Mega Surf kayak & Tiderace Demo and open surf session Oct 29th. 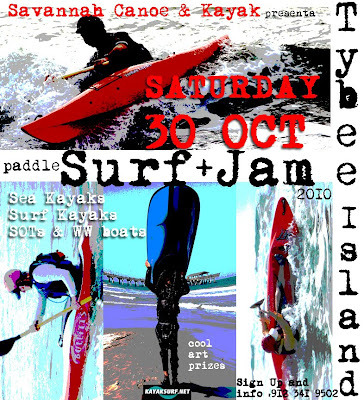 And then the Surf Jam Oct 30th...the only beginner oriented paddle surf competition on the East Coast. Great art prizes and fun community event for all. Sign up now. Well, of course there's the big show with all the big names on Tybee for BCU (BCYOU) week. Catch a pint with the Nigels Dennis and Foster, the kayak industries 2 top designers, instructors and paddling gurus available for interesting insider information and story telling. 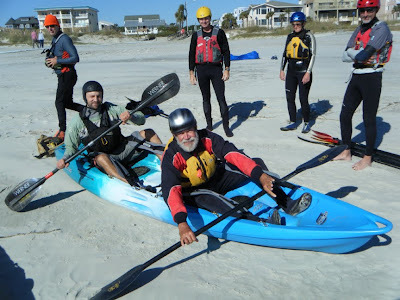 Catch a rough water class with Dale Williams, the founder of SKG..teaching back on Tybee for the first time in 5 years...back by popular demand, no doubt. Buy a copy of Gordon Brown's excellent Sea Kayak book and then take it to Doc's pub for him to sign...in exchange for glass of single malt, of course. And who will be missed ? Alas,the marvellous, mechanical Ben Lawry will not be appearing here this year and neither will the Green Team, Messrs's Sheri and Turner. Their excellent styles and techniques will be sorely missed. Bring it on to Tybee and lets kick off the 'Off' season with a bang. Here's a nice video to get you in the mood for autumn. ....because the 'Off season' is actually the 'On season'. Did you know shark finning takes place in US waters ? Did you know the fins are removed and the shark is tossed back alive into the ocean ? Does this sound somewhat cruel, barbaric and un American ? Each year, millions of sharks are killed just for their fins. Sharks are vitally important to our waters, helping balance marine ecosystems in their role as apex predators. The Shark Conservation Act would end shark finning in U.S. waters and make us world leaders in shark conservation. Take action. Send a letter now. Here's a little snippet from last weekends surf camp down in Jacksonville, Fl. The video camera was on the fritz and we missed most of the 'surf' action, but you get the idea.